He leads Isles defensemen in scoring and had three assists in win over Los Angeles. 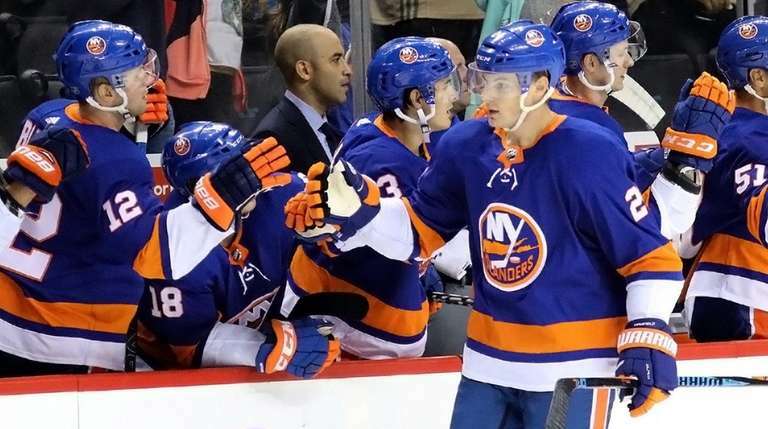 SAN JOSE, Calif. — The points have come for Scott Mayfield, but the Islanders’ leading scorer among their defensemen understands that’s not the priority. Still, the 6-5, 223-pound Mayfield, who was a healthy scratch in the season’s first two games, knows he has a good chance to build even more momentum when the Islanders conclude a four-game road trip against the Sharks on Saturday night at SAP Center. Mayfield had three assists and was a plus-5 in 20:04 in Thursday night’s 7-2 win over the Kings in Los Angeles. That gives him a goal and four assists in four games. The other six Islanders defensemen have totaled three assists. Mayfield finished last season without a point in his final 14 games. He also had an assist in Wednesday’s 4-1 loss at Anaheim — Casey Cizikas tipped in Ross Johnston’s deflection of Mayfield’s shot from the point — but Mayfield said he made an adjustment that led him to be more effective against the Kings. Cizikas knocked in the rebound of Mayfield’s blast from the right point for the Islanders’ first goal Thursday. Leo Komarov made it 6-2 on a delayed call as Mayfield took a high stick from Adrian Kempe. Andrew Ladd capped the scoring, tipping in Mayfield’s blue-line slap shot. Notes & quotes: The Islanders did not practice Friday and did not issue an update on Robin Lehner. The goalie left Thursday’s win late in the third period after being hit by a high shot. Barry Trotz would not say after the game whether Lehner, who made 28 saves in 52:42, went through the concussion protocol. Thomas Greiss, off to a 1-2-0 start with a 2.60 goals-against average and a .918 save percentage, made 40 saves in a 3-1 win in the Islanders’ last visit to San Jose on Oct. 15, 2017. Lehner made his Islanders debut with 35 saves in a 4-0 win over the visiting Sharks on Oct. 8.